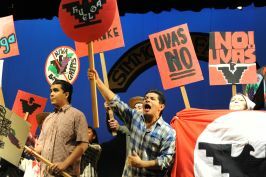 UFW Stories: "Celebrating Cesar's Legacy"
We have produced a musical telling the story. “Let the Eagle Fly” written by the late Julie Shannon and her partner John Reeger. We look to inspire a new generation through this musical. Additionally, we have housed workers who come to Sacramento and fed marchers. It has been an honor to serve. On April 23, our Teatro Nagual board along with La Familia Counseling Center presented youth voice participants who are learning Cesar’s core values and later will produce a reduced version of this musical. Three young people stood up and told Sacramento Mayor Kevin Johnson and the City Council how learning about Cesar has inspired them today and they stood in solidarity wearing their “Huelga” pins to celebrate him. We are very proud to carry on the legacy.